DETROIT — Sarah Penney entwines her legs around long swaths of bright silk hung from the ceiling. She climbs up the fabric with both hands, then dramatically drops into an upside-down flip, suspended in the air. 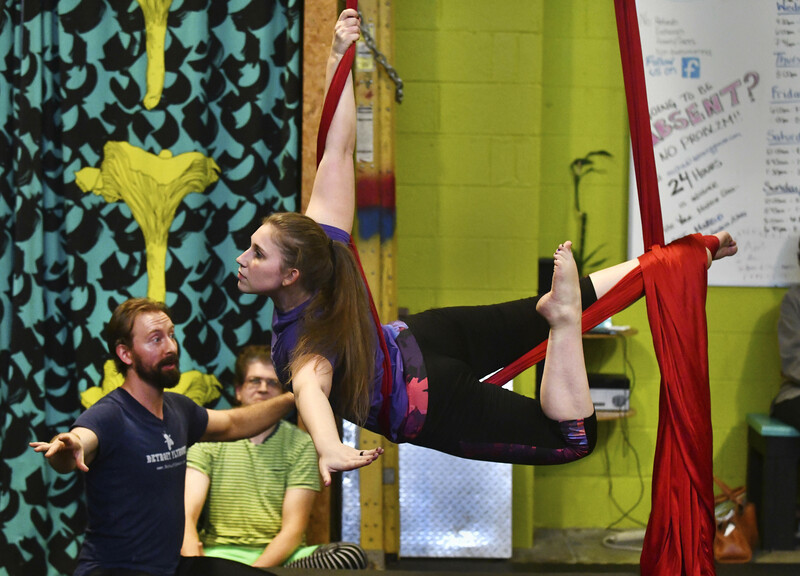 Penney, 27, of Detroit, was among 13 students practicing circus acts with four instructors on a recent evening at the Detroit Flyhouse Circus School, one of the city’s more surprising establishments. Located on the edge of Eastern Market, the lime green building on Watson houses suspended aerial hoops, also called lyra, and yards of purple, scarlet and emerald green silk, along with other circus equipment, including a trapeze. It is a training ground for those seeking to run away and join the circus, escape the monotony of the gym or for those who just get a rush while testing their agility and bravery, The Detroit News reported. On that particular evening, they included, among others, a mix of millennials, an 11-year-old girl, a Ford Motor Co. engineer, an electrical engineer, an architectural designer and a 53-year-old semi-retired student who commutes from East Lansing. And later in the month, students can decide whether to sign up for the next student circus performance to be held July 10 at the Eastern on Russell Street, a warehouse event venue. Performances take place four times a year. Penney, a wife, mom and part-time bartender, has been coming to the school for the past five years, only taking off a few months after the birth of her son, River, now 3. The circus school is owned by husband and wife team Matt Buss and Micha Adams Buss. They live on a farm and animal sanctuary in Jackson County and have operated the school for 10 years. It started out in Corktown, then moved to Eastern Market. Their first class enrolled about four students, and they now have 21 classes. It was a natural to open a circus school in Detroit, they said. The wife is a former circus performer and her husband continues to perform with Detroit Circus and teach at their circus school. For Adams Buss, “I wanted to create a place where people, kids and adults alike, could play, grow and learn amazing skills at their own pace.